» Snack and Sip All Day? Risk Decay! Good oral care is part of a healthy lifestyle. It's easy to keep your teeth and gums in good health. A simple routine of daily teeth cleaning, good eating habits and regular dental visits can help prevent tooth decay (cavities) and gum disease. What causes tooth decay and gum disease? Your teeth are covered with a sticky film of bacteria called plaque (sounds like PLAK). After a meal or snack, these bacteria convert the sugar in foods into acids. These acids attack the enamel, the tooth's hard outer layer. Plaque can also build up overnight while you are sleeping. 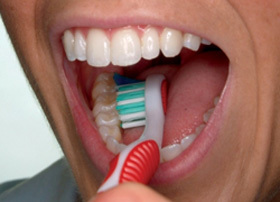 Repeated attacks can cause the enamel to break down and lead to cavities. Your saliva reduces plaque by cleansing the mouth and helping to digest food while you chew. But, if there is not enough saliva, the number of bacteria in your mouth will increase along with the amount of acid they produce. This lack of saliva flow is called "dry mouth" and can be caused by certain medications or chronic diseases, such as diabetes. Dry mouth may increase your risk of tooth decay. If you brush twice a day and floss once a day, you can remove most of the harmful plaque and bacteria. But if plaque stays on the teeth, it will eventually harden into tartar. Tartar can build up near the gum line. 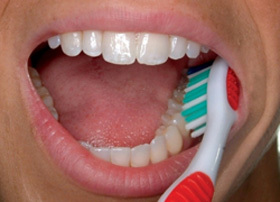 Since tartar is more difficult to brush or floss away, it gives the bacteria a place to grow without being disturbed. Plaque that is not removed can also irritate and inflame your gums, making them swell or bleed. This is called gingivitis, the early stage of gum disease. The good news is that gingivitis can be reversed with professional dental cleaning and good oral hygiene at home. If gum disease is left untreated, it can cause your gums to pull away from the teeth. Pockets or spaces can form between the teeth and gums. These pockets can become infected. In advanced stages of gum disease, bone loss can occur and teeth may become loose, fall out or have to be pulled. You may prevent both tooth decay and gum disease by always remembering to brush twice a day and floss daily. It is much easier and less expensive to prevent tooth decay and gum disease than to treat them! What are some tips for brushing teeth properly? 1. Place the toothbrush against your gum line at a 45-degree angle. This angle makes sure that you are fully reaching the gum line as well as the tooth surface. 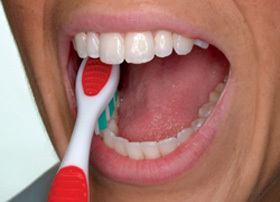 Move the brush back and forth gently in short, tooth-wide strokes. 2. Brush the outer tooth surfaces, keeping the toothbrush at a 45-degree angle to the gums. 3. 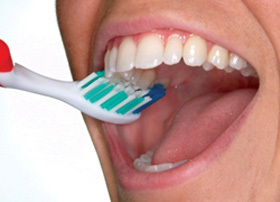 Brush the inner tooth surfaces. 4. Brush the chewing surfaces. 5. 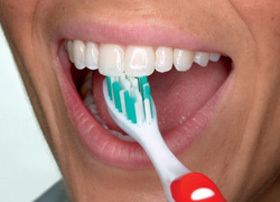 Use the top part of the brush to clean the inside surface of the top and bottom front teeth. Use a gentle up-and-down motion. 6. 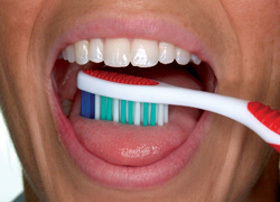 Brush your tongue to remove bacteria which may help freshen your breath.